Studying abroad: Canada - Which? The education system in Canada has more in common with that of the UK than the US. Universities are publicly-funded through taxes and tuition fees are set at a similar rate to English universities. The annual academic year is split into three semesters: fall is end of August/start of September to December/January; winter spans January to April; and summer is April/May to July. Each Canadian province is in charge of education within that area, regulating standards which are considered to be world-renowned. Twenty Canadian universities made the 2014–15 QS World University Rankings and four made the 2014-15 Times Higher Education World Rankings: University of Toronto (20th), University of British Columbia (32nd), McGill University (39th) and McMaster University (94th). An application takes time and preparation; ideally you should start a year before your course starts. Applying to Canadian universities is complicated because all 10 provinces in Canada have their own education systems, so there is no national Ucas equivalent. We recommend you first find the universities you like the look of, and then get in contact with them directly to ask how you should apply to them. As a UK citizen, provided you satisfy the requirements, you shouldn't have too much trouble obtaining the proper credentials to enter Canada. Once you have been accepted by a university, you'll need a study permit which you can apply for through the official Citizen and Immigration Canada website. You need to demonstrate that you can afford your tuition and living expenses through bank statements and notifications of any financial aid you'll be receiving (usually you need to show that you have $10,000 to support yourself per year while studying). You'll also have to satisfy other requirements like passing a criminal background check and proving you have sufficient health insurance. When you graduate, you can apply for a Post Graduate Work Permit (PGWP), which can last for up to three years – this is based on how long you have studied in the country for. Once you gain Canadian work experience on top of that, you can apply for permanent residency without having to leave the country. By international study standards, Canada is pretty affordable - but still not cheap! The average tuition fees at institutions such as the University of Toronto or McGill University is just over £10,000 a year. While the cost of living varies depending on which province you're studying in, generally it is cheaper than living in the UK. You'll find that modern cities like Toronto or Vancouver are much cheaper compared to London, and you can live for even less elsewhere. To give you an idea, a room in a shared apartment in Toronto might set you back $350-500 CAD per month. All international students in Canada are required to have health insurance. Each province dictates their own individual health plans and the terms for international students will vary. If you find that you are not covered by your province's health plan or it does not cover everything you require, you can apply for private health insurance. Make sure you factor these costs in to your budget. There aren't really many scholarships given by the Canadian government or non-profit organisations – your best bet by far is to apply to the universities directly. Some universities offer scholarships to undergraduate international students. For example, York University gives out $60-100,000 (CAD) in scholarships every year for international students with excellent academic records. Do ask the admissions departments what scholarships you're eligible for. It would be a bit of an injustice to see Canada as simply 'America…but colder'. That said, Canada does have pretty nippy weather. Toronto will see highs of 21 degrees in the summer, dropping into minus figures in winter. The western provinces like British Columbia and Alberta see the coldest weather while the thermostat only plummets further as you head north (think minus up to twenty degrees!). So warm clothing is a must if you choose to study in Canada. With mountains, rivers and several national parks – as well as world famous landmarks like the Rockies and Niagara Falls – Canada is perfect if you love the outdoors. Go biking, hiking or rafting to properly explore these, and even take up photography to document these sights – you'll be inspired! Canada most definitely has a unique identity of its own separate to that of its US neighbour – something which they're proud of. Hockey is the national sport, with most Canadians growing up with a pair of skates perpetually on their feet. Canadians are known for being very easy-going people. Different nationalities and ethnicities have always been welcomed in Canada. Back in the 1970s, Canada led the way when it was the first country to introduce an official policy of multiculturalism to recognise the value of its citizens' various ethnic and racial backgrounds. You'll come across large numbers of Chinese, Scottish, German and Italians throughout Canada. In the province of Quebec, French is the first language! Is studying in the States your 'American Dream'? 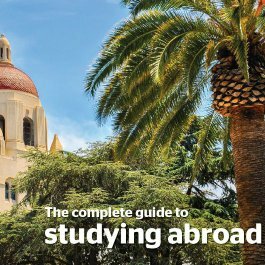 Read our full guide to studying at an American university. Considering studying in the Netherlands? Here's everything you need to know including the rather different philosophy on entry requirements, Numerus Fixus, and student life in the country.